Then it gets a little weirder. Once upon a time, in a gloomy castle on a lonely hill, where there were thirteen clocks that wouldn’t go, there lived a cold, aggressive Duke, and his niece, the Princess Saralinda. She was warm in every wind and weather, but he was always cold. His hands were as cold as his smile, and almost as cold as his heart. He wore gloves when he was asleep, and he wore gloves when he was awake, which made it difficult for him to pick up pins or coins or the kernels of nuts, or to tear the wings from nightingales. 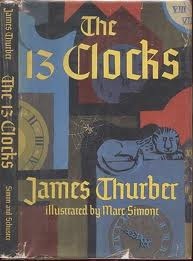 So begins James Thurber’s sublimely revamped fairy tale, The 13 Clocks, in which a wicked Duke who imagines he has killed time, and the Duke’s beautiful niece, for whom time seems to have run out, both meet their match, courtesy of an enterprising and very handsome prince in disguise. Readers young and old will take pleasure in this tale of love forestalled but ultimately fulfilled, admiring its upstanding hero (”He yearned to find in a far land the princess of his dreams, singing as he went, and possibly slaying a dragon here and there”) and unapologetic villain (”We all have flaws,” the Duke said. “Mine is being wicked”), while wondering at the enigmatic Golux, the mysterious stranger whose unpredictable interventions speed the story to its necessarily happy end. Apparently Thurber wrote this book while on a trip to Bermuda. He was supposed to be finishing up another of his books (I don't know which) but took a break to write this one. He says of it that it is " . . . an example of escapism and self-indulgence." He also thanks his wife in the Forward for reading several drafts while he was working on it. He also thanks her, "for constructive criticism and for waking me out of nightmares, some of them about the Todal, I suppose, but the worse ones, on the darkest nights, about thew whole enterprise in general." I like the way that sounds but the story itself seems to be so rushed, choppy and, at times, nonsensical that I have a hard time recommending it on the whole. This is certainly not a book to pick up in spare moments, here and there. If you did decide to read this, I recommend doing so in one sitting. It's so bizarre that it's better to keep the flow going as best you can in your own brain. I'm not sure what flow, if any, existed in Thurber's. The story was set to music by Mark Bucci and appeared in 1953 as the 5th episode of The Motorola Television Hour, with Basil Rathbone as the evil Duke. It was also adapted and produced by Stephen Teeter for use in the 1960s in a production in Berkeley, CA. Later it was adapted and produced by Frank Lowe for stage, and published in 1976 by Samuel French, Inc. Audio recordings have also been produced, performed by Lauren Bacall, Peter Ustinov and Edward Woodward. The BBC produced a radio version of the story with Heron Carvic as the Golux. Christopher Theofanidis wrote an opera based on the story in 2002. An opera! That just makes it even more amazing in my simple little brain! I suppose you could call this story humorous but you sort of also have to force yourself to laugh. Or, dare I say, be very, very drunk when you read it. I'm not sure Thurber wasn't when writing it. As I say, the story flows but only if you read it from start to finish without any interruptions. Don't even stop to go to the bathroom. If you do, I make no promises as to what you'll find when you come back to it. Sounds like this one should have remained in draft form, never to see the light of publication. I too loved Walter Mitty, both the short story and the movie. I laughed through this WHOLE review. I love your torn I-kind-of-like-this,-but...this-is-so-weird...and-slightly-disturbing. This part was the best: "Thurber is kind of...well...weird. Hard to take. Fanciful. Writes in choppy sentences. (Wait...!?)" HAHAHAHAHA! I loved this book. I don't think I was drunk because I was a teenager, but inebriated...teenager, sometimes I wonder if there is a real difference. Kidding...any teenagers who may read this! You make me long to read this again! I hope you don't think I'm too crazy, but I just thought it was the funniest thing I've ever read. Dark sense of humor I guess. I'm a big Thurber fan. (My copy of Lanterns and Lances is well used.) I must admit that The 13 Clocks is a truly bizarre book. As your review indicated, though, read through in one sitting, it is almost a psychedelic experience. Thurber was an insomniac, and his non-fiction descriptions of his long nights awake may give a bit of an explanation for this story. It probably does arise out of a dream during fitful sleep. I (and my daughters) really enjoyed this one, but I truly can't remember much about it! I did have some moments of wondering, "Should I be reading this to my kids" but I don't remember why. Your review is great! -- makes me want to revisit it. A picture book by Thurber that you might like is Many Moons. Worth looking into -- great fun and satire.